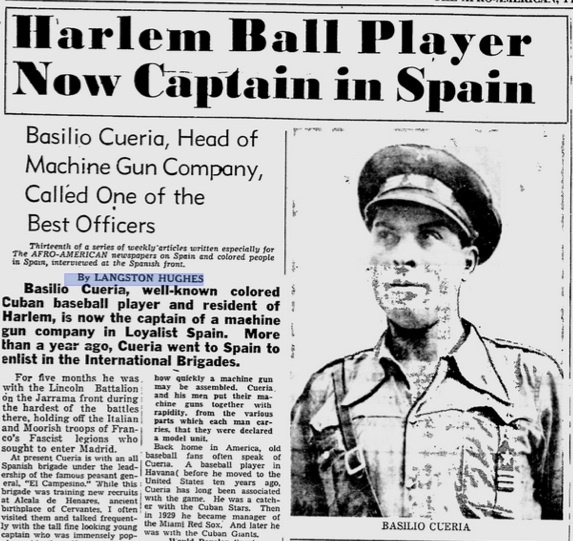 As I mentioned in an earlier post, the curators of the museum show “Nueva York: 1613 – 1945″ (New-York Historical Society, Museo del Barrio) used the Spanish Civil War in New York as a kind of provisional endpoint for the exhibition’s sweeping narrative about Spanish-speakers in Gotham. The exhibition showed how the war brought together in common cause many of the different national groups of hispanos who had been settling in New York in the XIXth and early twentieth centuries. 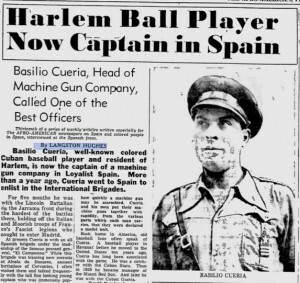 One of the objects displayed in the concluding panels of Nueva York was this fascinating article written by Langston Hughes about the Afro-Cuban baseball player and Harlem resident, Basilio Cueria (see full article here Cueria_Langston).